iPad Fruit Flight - available now! Discussion in 'iPhone and iPad Games' started by RyanUK, Sep 7, 2015. Im Ryan, an independent games developer from the UK and Im now releasing my first two games to the App Store, this is one of them! Fruit Flight, a challenging and bright casual game, involves guiding Eric through the skies on his jetpack collecting as much fruit as possible. To help, you can collect powerups which gain more points; but be warned, some fruits will hinder your efforts! You can compete with your friends on the leaderboard to become ruler of the skies! You can find more information at ryanbournedev.wordpress.com/fruitflight. Fruit Flight is designed with the Cocos2d-Spritebuilder game engine and is supported with un-obtrusive adverts on the menus; no initial purchases or in-app purchases are required to play this game! Fruit Flight is launching today, download at app2.it/fruitflight! Id really appreciate some feedback, and if you like it do feel free to keep playing and share with your friends, follow the twitter account and like the facebook page! Welcome to the flight school! You'll be helping to guide Eric - a jetpack pilot - to collect lots and lots of fruit! 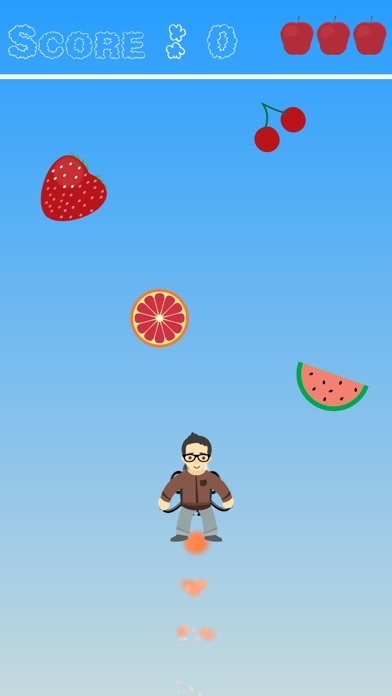 By touching and sliding your finger along the screen or by tilting your device, you can tell Eric where to fly to collect the fruit as he flies upwards. If you miss 3 bits of fruit in a row, then Eric will have to return back home; failure isn't an option today! Luckily there are some fruit which will help Eric fly even better than before; but some fruit will make it near-impossible to stay in control. Learn how to react quickly to the different fruit in order to keep Eric flying for as long as possible. Remember - you're not on your own, lots of others are also competing to be the best pilots and your score will be shown on the leaderboards - get the best score to be the ruler of the skies! I'm already seeing people on Fruit Flight! If you like it, feel free to drop me a tweet or leave a comment here! All feedback is highly appreciated! Have a good day everyone, as per normal feel free to leave feedback here or on my Twitter page! Hello again, another quick update! The stats are getting better and better as we go along, but we could still really do with some feedback! We've got a few new features thought out, but we'd love to see what you think! I'm also very impressed with the person who's beating me on the leaderboards right now... not for long though! I've released a new update for Fruit Flight - feel free to check it out here: app2.it/fruitflight! Although in this version I haven't focused on new features, I have fixed a few minor issues and made it run even more smoothly than before! It's definitely worth a look if you've got some time free and want to try something new! If you keep an eye out on my website, Twitter or Facebook you'll hear some very big news about both Fruit Flight and Asterun really soon; along with some new projects that I'll be announcing!